Metformin is a generic drug that belongs to a class of diabetes medications called bigaunides which helps reduce blood sugar levels in the body by decreasing the amount of sugar produced by the liver and simultaneously increasing the sugar absorption abilities of the muscles. Metformin has also been shown to reduce LDL (low-density lipoprotein, or “bad”) cholesterol levels. Diabetes is a chronic condition that affects more than 300 million people worldwide. If left uncontrolled, diabetes can cause serious health problems, including kidney failure, heart disease and loss of limbs. In addition to diet and exercise, medication like Metformin is often needed to help manage diabetes. According to the World Health Organization, Metformin is one of only two existing oral antidiabetic medications, and the only one that has been proven to prevent the cardiovascular complications of diabetes. As a generic medication, metformin is manufactured by a number of different pharmaceutical companies, including Teva USA and Watson Pharmaceuticals. Brand names for metformin include Glucophage and Glucophage XR, which is made by Bristol-Myers Squibb, Fortamet, which is made by Shionogi, Inc., Glumetza and Riomet. Because of its ability to reduce blood sugar levels in the body and regulate insulin levels, the most common use of metformin is as a treatment for type 2 diabetes. Lately, it has also been proven to be effective in some cases in gestational diabetes, although the safety of this treatment during pregnancy is still contested. Metformin is also used to treat polycystic ovary syndrome, a hormonal disease in women that has also been linked to type 2 diabetes. It may also become used as a weight loss treatment for obese individuals once current research in this area has been successfully completed. Metformin also improves the body’s response to insulin, the hormone responsible for transporting sugar from the bloodstream into the cells. It is often prescribed with insulin to help people with diabetes better manage their blood sugar. Metformin is not used to treat type 1 diabetes. Metformin should be taken as directed by a doctor and as indicated on the prescription bottle. It is most often taken once a day with the evening meal. When prescribed metformin, it is important to carefully monitor blood sugar, especially during periods of stress or travel. People taking this medication should not skip meals. Extended-release metformin should not be chewed or crushed before swallowing. A missed dose should be taken as soon as possible. Although it is rare, metformin can cause a life-threatening condition called lactic acidosis. It is most commonly seen in people with liver disease, congestive heart failure or those with a serious infection. Surgery can also increase risk, and metformin may need to be held for 48 hours prior to surgery, even dental surgery, to reduce risk. All adjustments in medication should be under the direction of a physician. 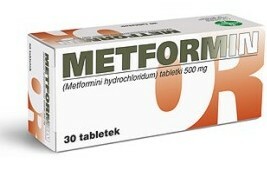 Metformin is a first-line medication for the treatment of type 2 diabetes. It is also used as a treatment for gestational diabetes and polycystic ovary syndrome. It is also the only diabetes medication shown to help reduce risk of heart disease. As a prescription medication, metformin should only be taken as directed by a physician.